Team Suzuki Ecstar’s Alex Rins has earned his maiden victory in the premier class during round three of the 2019 MotoGP World Championship at Circuit of the Americas, while Australian Jack Miller (Pramac Racing) earned his first podium in three years. As the lights went out it was Cal Crutchlow (LCR Honda Castrol) who got the better launch out of the front three on the grid, with Valentino Rossi (Monster Energy Yamaha MotoGP) also getting off the line well as the duo pulled alongside Marc Marquez (Repsol Honda) up the hill, but it was the pole man who was bravest on the brakes to grab the holeshot. Rossi and Crutchlow slotted into second and third as the duo tried to keep tabs on the leader, with Andrea Dovizioso (Mission Winnow Ducati) making a stellar start from P13 to move up to P6 on the opening lap. Crutchlow’s race then came to a premature end as he crashed out of contention at turn 11 on lap six, which started a chain reaction of Texas hauntings for Honda. With a three-second lead on lap nine, Marquez was clear of the rest and the magnificent seven was well in sight. But then the unthinkable happened – the king of COTA crashed at turn 12 as the number 93 tucked the front and it was race over, his RC213V didn’t want to restart and his crown was lost. Then, Jorge Lorenzo (Repsol Honda) was out. Rins had got past Miller for third and it was soon Rossi vs Rins for the Americas GP win. 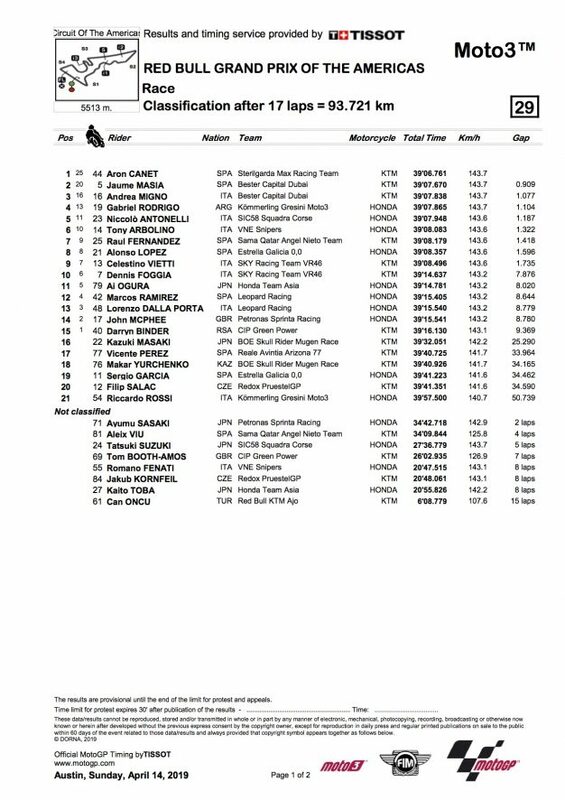 Rossi was cracked the whip at the front with Rins less than half a second back, their gap to Miller was over two seconds as the Australian found himself in a lonely third. Crossing the line, it was Rins by 0.462s over Rossi. 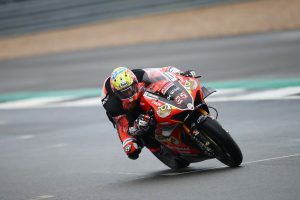 Miller fended off a charge from Dovizioso, who inherited the points lead, as Franco Morbidelli (Petronas Yamaha SRT) rounded out the top five to pick up his best premier class result. The top 10 was completed by Danilo Petrucci (Mission Winnow Ducati), Fabio Quartararo (Petronas Yamaha SRT), Pol Espargaro (Red Bull KTM Factory Racing), Francesco Bagnaia (Pramac Racing) and Takaaki Nakagami (LCR Honda Idemitsu). 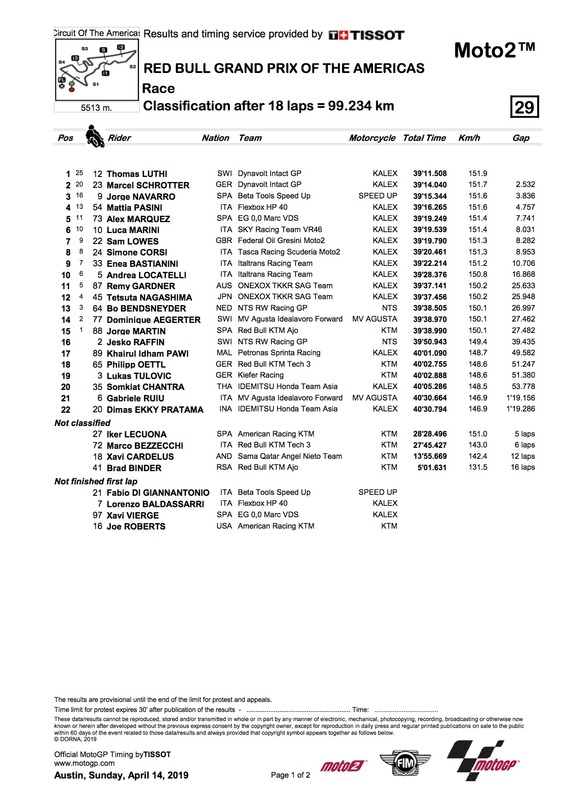 Tom Luthi (Dynavolt Intact GP) put in an outstanding Texas ride to take Moto2 victory, Swiss rider leading a Dynavolt Intact GP 1-2 as Marcel Schrotter crossed the line second as Jorge Navarro (Beta Tools Speed Up) completed the podium. 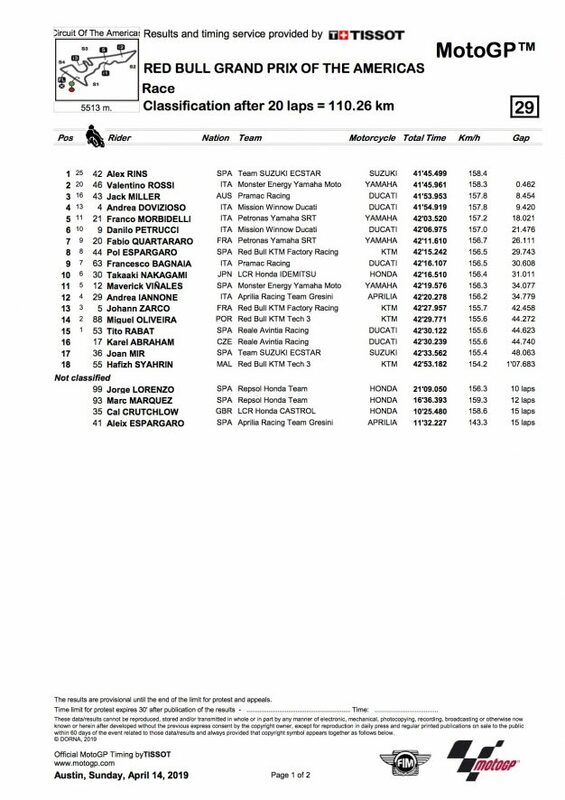 Fourth and fifth were credited to Mattia Pasini (FlexBox HP 40) and Alex Marquez (EG 0,0 Marc VDS), as Australian Remy Gardner (SAG Racing Team) was 11th. 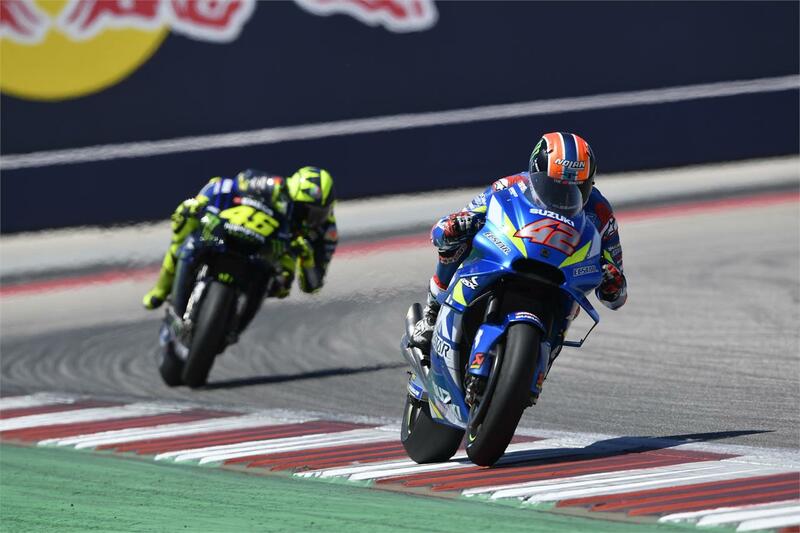 In Moto3, Sterilgarda Max Racing Team’s Aron Canet conquered COTA after breaking clear on the final lap in Austin to take his maiden victory over Jaume Masia (Bester Capital Dubai) and Andrea Migno (Bester Capital Dubai). Gabriel Rodrigo (Kömmerling Gresini Moto3) and Niccolo Antonelli (SIC58 Squadra Corse) were fourth and fifth respectively. The MotoGP World Championship now heads to Jerez in Spain for round four, scheduled on 5 May.